يشكل Macrossan House Boutique Holiday Apartments بموقعه الممتاز في بورت دوجلاس نقطة انطلاق جيدة لاستكشاف هذه المدينة النابضة بالحياة. يقع مركز المدينة على بعد 0.0 km فقط. ويمكن الوصول إلى المطار خلال 60 دقيقة. بالنسبة لمن يريد الخروج، هذه بعض المعالم السياحية المتوفرة للزوار Des Spencer Art, Coffee Works, The Book Lounge. إن Macrossan House Boutique Holiday Apartments حريص على توفير الراحة للنزلاء، فلا يوفر الموظفون جهداً في تقديم أفضل الخدمات وضمان حسن الاستقبال. يقدم الفندق فرصة للاستمتاع بشريحة واسعة من الخدمات بما فيها: واي فاي مجاني في جميع الغرف, خدمة غسيل ذاتية, مجهز لذوي الإحتياجات الخاصة, مطبخ, مرافق مخصصة لذوي الاحتياجات الخاصة . في Macrossan House Boutique Holiday Apartments غرف نوم يزيد عددها عن 16 صممت بذوق وعناية لتوفر لك كل وسائل الراحة . بعضها يحتوي أضاً على تلفزيون بشاشة مسطحة, غرف لغير المدخنين, مكيف هواء, خدمة الإيقاظ, شرفة/ تراس. يقدم الفندق مجموعة رائعة من الخدمات كمثل مركز للياقة البدنية, مسار جولف - ضمن 3 كم, حمام سباحة خارجي, تدليك, ملعب تنس، لجعل إقامتك تجربة لا تنسى. يشكل Macrossan House Boutique Holiday Apartments بخدماته الراقية وموقعه الممتاز، قاعدة مثالية للاستمتاع بإقامتك في بورت دوجلاس. Could only ask for a bit more than bare minimum of soap and toilet paper before needing to buy more. Otherwise ample room, fantastic location, helpful host. Had a nice relaxing couple of day there, great room, cozy bed and friendly service! Bed comfortable. Good bathroom. Nice view garden . Very good owners. We stayed at the apartment for 5 nights and it was just perfect for that amount of time. It is centrally located to everything you will need. The room is pretty clean and the hosts Pip and Trevor were really nice, friendly and helpful. They helped us with great advice about tours etc. Would definitely stay here if I head back to Port Douglas. Great location, lovely room it was very clean and spacious! Sometimes a bit noisy eg-people moving furniture, doors closing, loud voices. Altogether a good visit. Really enjoyed our stay great location very clean room. Time for a few small maintenance things to be done. Trevor it would be nice if you smiled more. when I rand to ask for a bottle of champagne to be in our room on arrival. your remark we are not a bottle shop was very rude. We did get one thank you for that. Excellent accommodation. Right in the Main Street, close to everything. Appartment was well equipped, very clean and very affordable. It was in the Main Street and Coles supermarket next door (great for self-catering). Staff were very friendly and helpful. We dined at the Central hotel and had 2 great meals. Staff there very friendly, waitress Diane a real asset. Walking distance to everything. Would definitely recommend and stay there again. Terrible Internet, filled out two trouble tickets and never received a reply, no fault of the owners, just a bad choice for providers. Air condition never really felt cold. Macrossan House Boutique Holiday was right in the hub of things in Port Douglas. 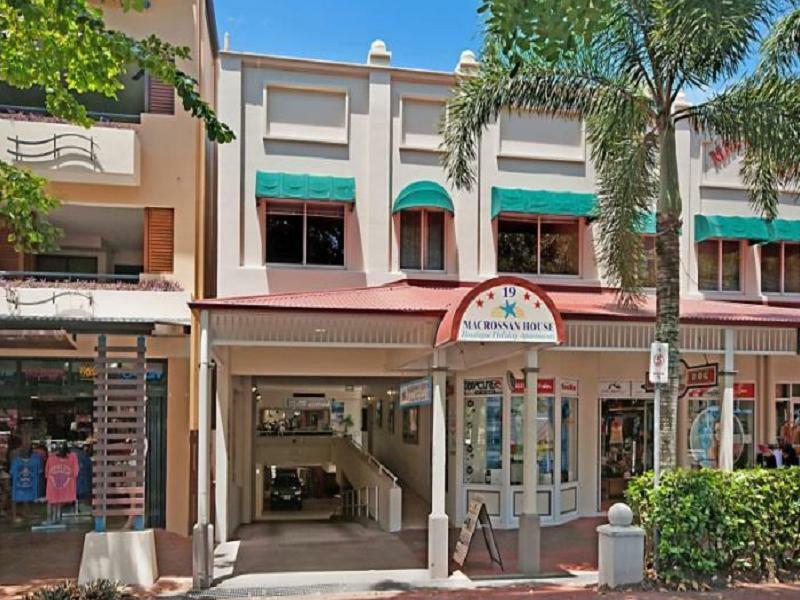 Leisurely stroll to Four Mile Beach, next door to supermarket and close to dining and shops. We had a very pleasant stay. Staff were friendly, apartment clean and comfortable. Nice to have the option of cooking facilities. Felt private and quiet even though on the main street. We loved how it was a short walk to port, beach and shops and dining. Good value for money. We would certainly stay here again. This small boutique hotel is situated in the heart of the main street. The rooms are clean and a generous size. Owners very friendly. Perfect location! Had a very nice stay at Macrossan HOuse. Rooms are clean and comfy, location is right in town and close to the beach as well. Trev and Pip are great hosts. Will stay here again. Fantastic place to stay. Close to everything (but wasnt noisy), clean, felt very homely. I would stay here again if i came back to Port Douglas. The apartment was very nice and fully equipped. Open kitchen with fridge and microwave. Big living room and one master bedroom. Very comfortable, very convenient. Very close to the pier if you plan to do some diving/snorkeling. Very good stay. Right in middle of main street and a 5 minute walk to all important areas. Very convenient. The room was large and well equipped. Also very quiet so good nights sleep. Trevor and Pip very helpful with everything. This place is perfect. Close to all amenities. In the Main Street but not right at the front so you don't get the noise of any late night gatherings. The place has just been renovated and the room we had was awesome.